This right facing, 1/2 length miniature portrait of Elizabeth Rouse (1772-1849) is thought to have been painted between 1825 and 1830. Mrs Rouse appears to be aged in her 60s and she wears an ensemble of everyday garments comprising a dark-coloured [cotton] dress with a gathered bodice, the shoulders and neckline largely obscured by her light-coloured [wool] shawl, with a white-work embroidered [muslin] collar pinned at the neck with a square brooch. Her brown hair is covered with an indoor cap of sheer muslin or [embroidered] net trimmed with bands of white [satin] ribbon, elaborately arranged in a series of frills and bows over each ear. Elizabeth Adams (1772-1849) married Richard Rouse in 1796. The couple migrated to Sydney in 1801, where Rouse became Superintendent of Public Works and Convicts at Parramatta. 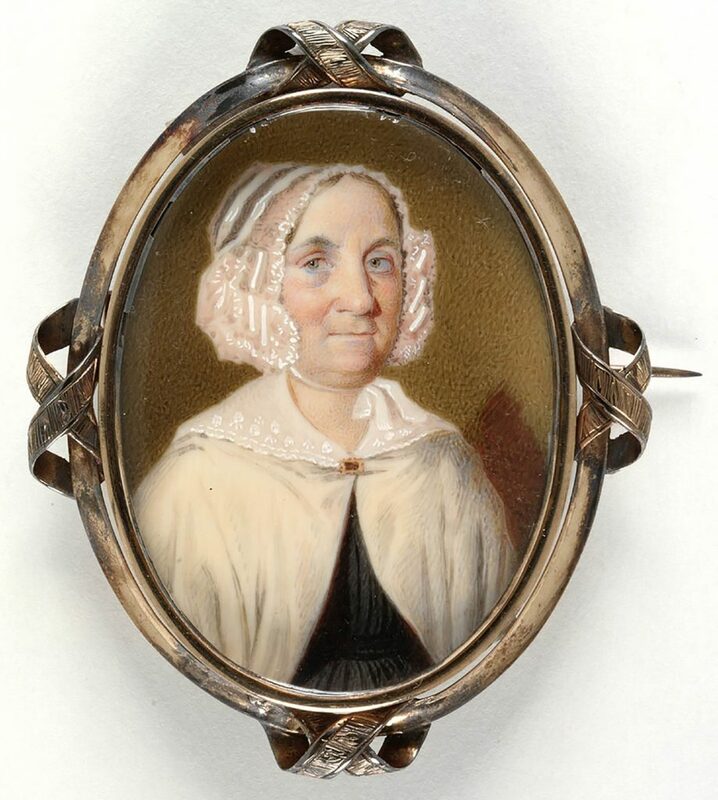 This miniature portrait has been set into a brooch which bears an inscription on the reverse dating from the year of the sitter’s death in 1849. A similar portrait (possibly a copy), painted by William Griffith (ca. 1808-1870) in 1847, is held by Sydney Living Museums in the Hamilton Rouse Hill Collection.